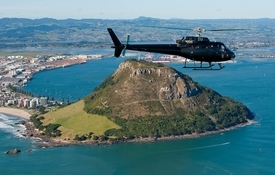 Mount Maunganui is a holiday paradise for you and your family and friends. The Mount is almost surrounded by the Pacific Ocean. You can surf, swim in the ocean, or walk around The Mount. You can also enjoy the many cafés in front of the beach with a beautiful sea view and sunshine. The Mount Maunganui Hot Salt Water Pools is right next to The Mount as well. Papamoa is the largest suburb in Tauranga. 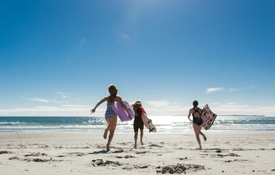 It's a 16km long, white-sand beach that curves along the coast between Mount Maunganui in the west and the Kaituna River in the east. It is an ideal place for fishing and surfing, also a perfect place for viewing the sunrise. 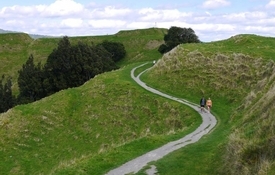 Papamoa Hills Regional Park is a wonderful place for all ages of people to explore. 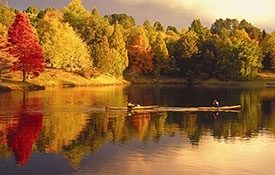 It has the most popular walking and running tracks in the Papamoa region. You can climb up to the 224m high summit to enjoy the breath-taking area views. Kaiate Falls is a 15-minute drive from Domain Road, Papamoa (via Welcome Bay Road and Waitao Road), a 30-minute drive from Tauranga. It is the right spot to cool down on hot summer days. The main track leads you to the top for a view of the falls, then continuing down the hill to the lower falls. The walking tracks are well-formed and sign posted. It is a great place for young and old explorers. 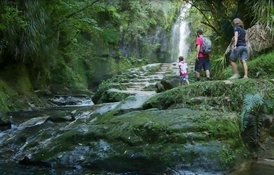 McLaren Falls Park is a popular place for camping, fishing, kayaking, picnics, bush walking, and is also a wonderful place for wedding photos. You can also have a chance to see the glow worms after dusk on the Waterfall Track. Marshalls Animal Park is a must-see place for you and your children while you travel through the park. It is a perfect place for all ages.